As NCRA members, court reporting students, schools, and others get ready for the start of the 2017 Court Reporting & Captioning Week being celebrated Feb. 11-18, a number of challenges and contests offering some hefty prizes have been issued across the nation. NCRA’s Student Committee has challenged court reporting students to transcribe as many tests as possible during the week to qualify for a prize. Under the contest’s rules, participants do not have to pass the tests, simply transcribe them. The first-place winner will be awarded a copy of NCRA’s RPR Study Guide. The second-place winner will receive a choice of a one-year student membership to the Association or one leg of the RPR Skills Test. The third-place winner will earn a $25 Starbucks gift card. Winners will be announced in the Feb. 22 issue of the JCR Weekly. Students taking the challenge will be required to submit a test verification form, signed by both the student and a teacher. The Texas Court Reporters Association (TCRA) is sponsoring Off the Record and On the Run, a virtual run being held Feb. 1-28, in celebration of Court Reporting & Captioning Week. Anyone can participate, according to Beth Faulk, TCRA’s executive director. 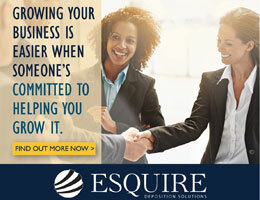 The event is expected to generate not only awareness and support of the court reporting profession but to also offer a healthy social outlet for court reporters who want to get together and have fun with their friends, Faulk explained. The cost to register is $25. 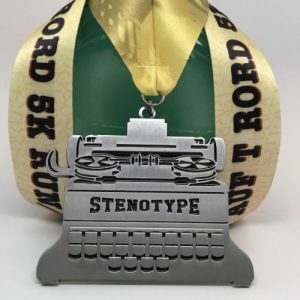 Participants who run 5k, 10k, or a half marathon will receive a four-inch retro style writing machine medal adorned with a ribbon that reads “AUF T RORD.” All proceeds will benefit TCRA to help it continue to provide quality education, advocacy, and services to its members. “Those who signed up first have already started receiving their medals and love them! Various reporters and groups are organizing to conduct their runs and walks all together at different parks and locations during National Court Reporting & Captioning Week,” Faulk said She noted that since it is a virtual run, participants can even compete on a treadmill. Although participants are encouraged to submit their finish time, they are not required to do so to receive their medal. Additional information and registration for the event is can be found at Virtualstrides.com. The friendly challenged issued by NCRA’s National Committee of State Associations (NCSA) is also heating up. The challenge calls on all state associations to join forces with their members to participate in career fairs, provide realtime demonstrations at high schools and guidance counselor meetings, or host a Veterans History Project events to celebrate Court Reporting & Captioning Week. Members of the Pennsylvania Court Reporters Association (PCRA) will be conducting three Veterans History Project interviews at local restaurants, including at one site in New Jersey. Julie Wilson, a PCRA district director said the association has both freelance and official court reporters from Chester, Bucks, Lancaster, and Philadelphia counties volunteering to interview and transcribe the stories of the veteran participants. The winner of the 2016 NCSA challenge, Erminia Uviedo, RDR, CRR, a freelance court reporter from San Antonio, Texas, said members in her city have already participated in 18 school demonstrations and have an additional eight more planned for later in the spring. Uviedo plans to exceed last year’s number of 26 school demonstrations to once again earn NCSA’s top honors. The competition for the NCSA challenge closes Feb. 18. Anyone participating in a qualifying event can receive credit for it by documenting their efforts at the NCSA contest site. All entries will automatically be entered into the contest. There is no limit to the number of contest entries states can have. Click on the NSCA challenge registration site to register your event. The ways to celebrate 2017 Court Reporting & Captioning Week are unlimited. To learn more how you can celebrate the week or to find the latest in resources, including press release templates, media pitches, presentations, and more, visit the Resource Center on NCRA.org or contact the NCRA communications team at pr@ncra.org. And don’t forget to share with NCRA how you celebrate. A record number court reporters, captioners, and legal videographers helped kick off the 2015 NCRA Convention & Expo this morning, the highest number of registrants in four years. Nearly 1,200 are registered for the event. The first day includes day-long pre-convention intensive CAT vendor workshops hosted by Advantage Software/Eclipse and Stenograph, the Association’s Annual Business Meeting, and the first day of the Realtime Systems Administrator Workshop. It also marked the first day of the Certified Realtime Captioner three-day workshop. This workshop is required to earn the new certification that combines the educational training of the Certified Broadcast Captioner and the Certified CART Provider certifications. NCRA members who currently hold the CBC and the CCP certifications will automatically become CRCs as of Jan. 1, 2016. Participants in the CRC Workshop will have the opportunity to take the written knowledge portion of the CRC test. Other highlights for day one of the convention include the National Realtime Competition, the National Committee of State Associations Meeting, the Only New Once Reception, and the Opening Reception in the Expo Hall.